As I've been looking at different nursery designs, I realized that I should have done more of this before I got pregnant. Now I'm finding myself being much more picky. To make matters worse, due to lack of space and a very opinionated mama, our little one won't be getting his own room for a little while yet. That being said, I believe that good design can be very beneficial to the development of little ones. Babies can only see in black and white. That doesn't mean that their rooms should look like that - bold colors and large graphic patterns in highly contrasting colors help their eyes to develop properly. 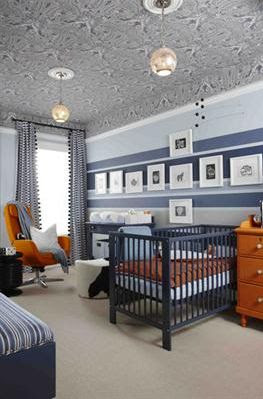 I love the ceiling treatments in these rooms - it keeps it interesting and gives baby something to look at. Another important aspect to incorporate into the room is texture. Babies (and toddlers) are very tactile learners. They love to touch (and eat) everything! Bringing in both tangible and visual texture adds so much more interest to the room. This room has so many wonderful textural elements and is very visually stimulating. 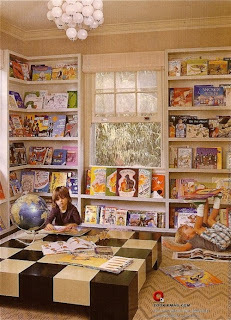 Books are so important to me and I hope to instill my love of reading in all of my children. When books are stacked on a shelf with only their spines visible, it's hard for kids to get excited about them. (They also tend to pull everything off the shelf in order to find what they're looking for.) 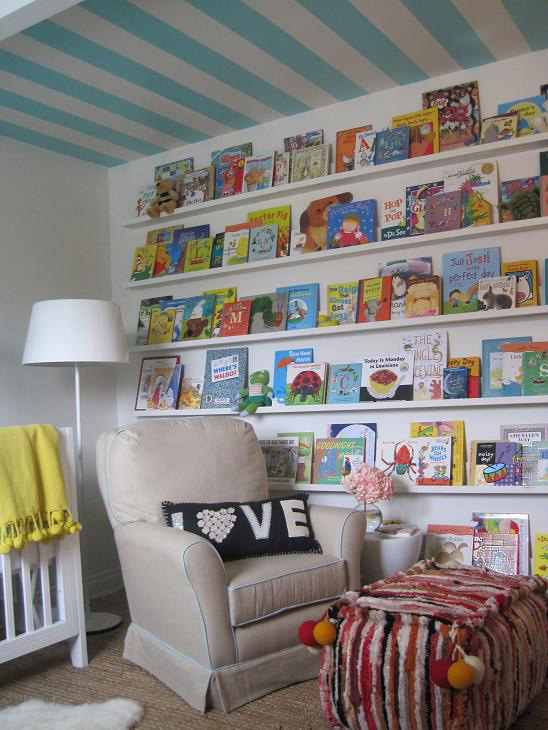 A great fix for this is a narrow shelf with a lip where books can be placed facing out. Doesn't that look so much more enticing? A quick and easy (and dare I say affordable?) way to get this look is by hanging picture ledges - just one or a whole series. Available here.